Author: Albert Balasch. Direction: Albert Arribas. Cast: Mònica Almirall, Jordi Collet, Oriol Genís, Antònia Jaume, Marta Ossó and Albert Prat. With special participation by Octavi Rofes and Anna Maria Iglesia. The artistic suicide of a poet at just 45 years old: a radical way of claiming the limelight without using conventional promotional means or an example of radical commitment to writing? These are some of the questions posed by 'Quadern del Frau', the result of five years’ work in which Albert Balasch rewrote and reorganised all his published works. 'F.R.A.U. ', a seven-hour piece, is the stage adaptation of 'Quadern del Frau', which ranges from happening to tragedy in verse and from visual art to post-dramatic rhapsody. 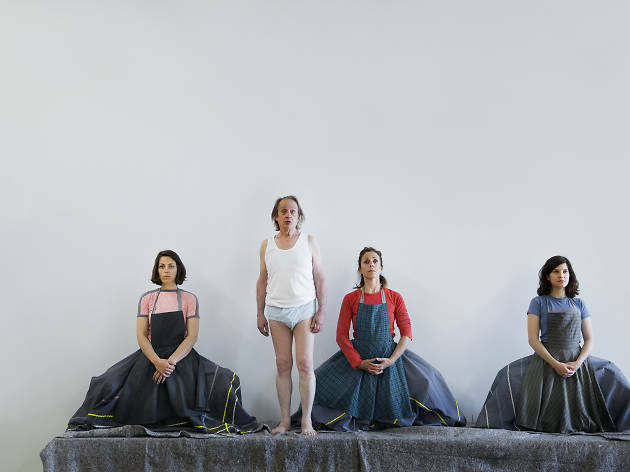 In short, a multidisciplinary show in which the director, Albert Arribas, explores the poet’s contradictions, at once rewriting and reorganising some of his own earlier productions, most notably 'Sala de miralls', a play that pays false tribute to Feliu Formosa and was presented at the TNC (National Theatre of Catalonia) in 2014.